Habit: [Annual] perennial herb to shrub. Leaf: simple, alternate or opposite, generally resinous-dotted, veiny, main veins generally 3. Inflorescence: heads discoid, generally clustered; involucre cylindric to bell-shaped; phyllaries generally graduated, +- green, veiny-striate, spreading in age; receptacle generally flat, epaleate. Flower: corolla cylindric, +- white to pale yellow-green, occasionally tinged red or purple; anther tip ovate; style branches long, club-shaped, tips rounded. Fruit: 10-ribbed, generally cylindric, generally hairy; pappus of 10--40+ generally minutely barbed bristles, generally white. Brickellia oblongifolia Nutt. var. linifolia (D.C. Eaton) B.L. Rob. Habit: Perennial herb or subshrub from woody caudex, 10--60 cm. Stem: branched, dotted with stalked glands to short-hairy and glandular. Leaf: generally alternate (+- opposite), sessile, 9--40 mm, 1--15 mm wide, elliptic, lance-linear, or oblong, entire, base acute to attenuate, tip acute or obtuse, faces puberulent to +- densely covered with long, crooked hairs, these occasionally mixed with gland-tipped hairs, veins obscure. 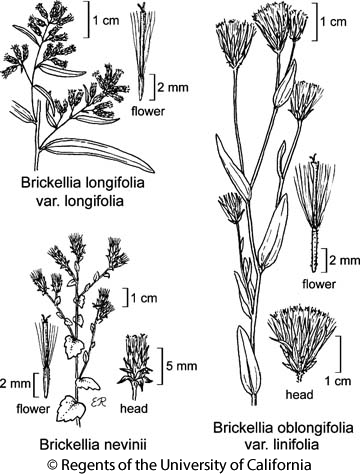 Inflorescence: heads 1 or in +- flat-topped clusters; peduncle 2--50 mm, short-hairy and glandular; involucre 10--20 mm, cylindric to bell-shaped; phyllaries 25--35 in 4--6 series, 4--5-striate, unequal, tip acute to acuminate, margin scarious, occasionally ciliate; outer lanceolate to ovate, gland-dotted to glandular-puberulent, inner linear to lance-linear, glabrous. Flower: 25--50; corolla 5--10 mm, pale yellow-green or cream, often purple-tinged. Fruit: 3--7 mm, minute-bristly or -hairy (glandular); pappus of 18--25, minutely barbed to +- plumose bristles. Chromosomes: 2n=18. Ecology: Desert, grassland, dry rocky hillsides; Elevation: 1200--2800 m. Bioregional Distribution: SnJt, SNE, D; Distribution Outside California: to British Columbia, Montana, Colorado, New Mexico. Flowering Time: Apr--Oct Note: Other variety in western United States, British Columbia. Citation for this treatment: Randall W. Scott 2012, Brickellia oblongifolia var. linifolia, in Jepson Flora Project (eds.) Jepson eFlora, http://ucjeps.berkeley.edu/eflora/eflora_display.php?tid=6917, accessed on April 24, 2019. SnJt, SNE, D; Markers link to CCH specimen records. Yellow markers indicate records that may provide evidence for eFlora range revision or may have georeferencing or identification issues. Purple markers indicate specimens collected from a garden, greenhouse, or other non-wild location.